HUNTINGTON BEACH, Calif. - June 13, 2018 - PRLog -- When writer-artist Pj Perez posted the last page of his serialized webcomic THE UTOPIAN in October 2010, that was supposed to be the end of the story. The protagonist–a high school revolutionary named James Douglas who crusaded for social justice as "The Utopian"–died in the tale's dramatic climax. The comics were published in four print issues and then a trade paperback, and Perez moved onto other projects. 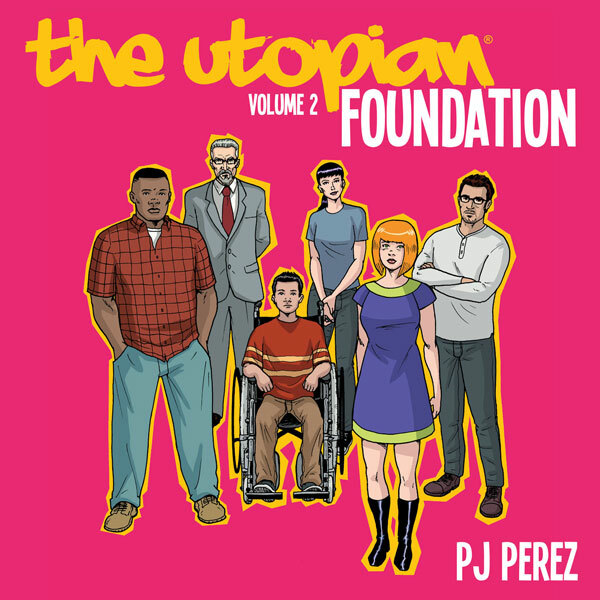 And yet, on July 17, THE UTOPIAN, VOLUME 2: FOUNDATION will prove that not only was Douglas' death not the true end of the story, but that Perez was far from finished exploring the world and characters he'd created. This new trade paperback collects all 176 strips from the webcomic sequel Perez ended up launching online in April 2012 as THE UTOPIAN FOUNDATION. In the new collection, nine months have passed since the death of James Douglas, and the community is still feeling the impact of his sacrifice. His friends Michelle Matterson and Sean Palmer are trying to find their footing as freshmen at Valley University. His former adversary, Sagebrush Principal Richard Praglin, has become one of the founders of The Utopian Foundation, a nonprofit inspired by Douglas' legacy. Sagebrush faculty and students prepare for a gala celebrating the opening of the Foundation's James M. Douglas Center for Conflict Resolution. But the launch of the Center is plagued by ghosts: Terrence "T-Rex" Smith's former gang affiliation, Luis Aguila's adjustment to life in a wheelchair, and unknown to anyone, the boiling rage of Danielle Perry, whose younger brother's death she blames on The Utopian. THE UTOPIAN, VOLUME 2: FOUNDATION (ISBN 9780990568865) features a brand-new cover by Perez with colors by Jason Lewis, as well as five pages of behind-the-scenes annotations for the entire story. The 102-page, full-color book retails for $19.99 and is now available for pre-order at http://www.PopGoesTheIcon.com, as well as Amazon.com, BarnesandNoble.com and local booksellers. The collection is also available now on ComiXology.